The availability of sequences of entire genomes has dramatically increased the number of protein targets, many of which will need to be overexpressed in cells other than the original source of DNA. Gene synthesis often provides a fast and economically efficient approach. The synthetic gene can be optimized for expression and constructed for easy mutational manipulation without regard to the parent genome. Yet design and construction of synthetic genes, especially those coding for large proteins, can be a slow, difficult and confusing process. DNAWorks automates the design of oligonucleotides for gene synthesis by PCR-based methods. 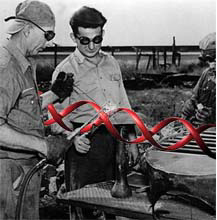 A description of the original DNAWorks can be found in our publication (Hoover, D. and Lubkowski, J., 2002). For further improvements in the performance of DNAWorks, feedback on the success or failure of gene synthesis using DNAWorks is very important. Please let us know about the outcome of your synthesis experiments. DNAWorks is open-source, and can be downloaded from https://github.com/davidhoover/DNAWorks. If you can find a a Fortran compiler, you can run DNAWorks via commandline. Job Name: You must enter a name for your job. Acceptable characters are [A-Za-z0-9_]. Entering your e-mail address is entirely voluntary. The results will be made available online at the end of the program run, but if an address is entered, the results will also be sent to that address. Online results will be deleted after two days. Mutant run (optional): All parameters from original logfile will override those from this page, except for job name, email and sequences. Sequence(s) (formats):Enter up to 99 sequence elements.